The museum has its own set of rare Baburnama (memoirs of Mughal Emperor Babur) paintings. From Kushan-era Buddhist murals to rare works of Nicholas Roerich to Chinese porcelain and Javanese puppets, the State Museum of Oriental Art has a diverse and impressive collection from the continent. Art lovers who visit Moscow usually make a dash for the city’s most famous museums such as the Tretyakov Gallery and the Pushkin Museum of Fine Arts. However, another museum in the heart of Moscow has a lot to offer to those interested in ancient Asian history. Mkrtychev was personally involved in the excavation of the Kara-Tepa Buddhist caves in Termez, Uzbekistan. The museum began sending its archaeologists to the region in the 1970s. Among the most impressive exhibits at the museum is a 2nd century AD mural of the Buddha and his followers. “It dates back to the Kushan Empire,” says Mkrtychev. The Kushan Empire spread from Uzbekistan all the way to Indo-Gangetic Plain. The museum has also has a model of the Kara-Tepa Caves, which bear an uncanny resemblance to Ajanta in Maharashtra, India. The Japanese collection is divided into traditional Japanese art and exhibits that display a strong Chinese influence. “The typically Japanese exhibits are completely different from the ones that have a Chinese influence,” says Mkrtychev. The highlight of the Japanese section is an artistic ensemble from the Meiji period: A sculptural composition with an ivory eagle on a pine tree and a four-sided screen. The ensemble was a gift from Japanese Emperor Meiji to Nicholas II, timed to the latter’s coronation day in 1896. During his visit to Japan in 1891, Nicholas, who was then the crown prince of the Russian Empire, survived an assassination attempt in Otsu. While the gift may have been an attempt by Emperor Meiji to make amends for the incident that virtually ruined the 1891 visit, Russia and Japan were at war in less than a decade after Nicholas II became Tsar. Besides porcelain and bronze Buddhist idols, the Chinese section has cricket boxes. Pu Yi, China’s last emperor was believed to have been fond of his pet cricket. “Chinese philosophers kept crickets for their music,” says Mkrtychev. The museum also has a huge collection of Thangka, Buddhist paintings on cotton or silk applique from Tibet, China and Mongolia, as well as the Russian internal republic of Buryatia. There is a particularly large collection of artwork from Vietnam and Indonesia. The collection from the Indonesian archipelago comprises of Hindu and Buddhist bronze idols as well as Balinese and Javanese shadow puppets. It also houses the largest collection of Indian exhibits in Russia after the Hermitage in St. Petersburg. Along with several bronze idols of Hindu deities from the 17th and 18th centuries, the museum has a 9th century Ganesha and 10th century idols of Ram and Krishna from southern India. “India is so diverse a country that it deserves a museum to itself,” says Mkrtychev. The museum has its own set of rare Baburnama (memoirs of Mughal Emperor Babur) paintings. 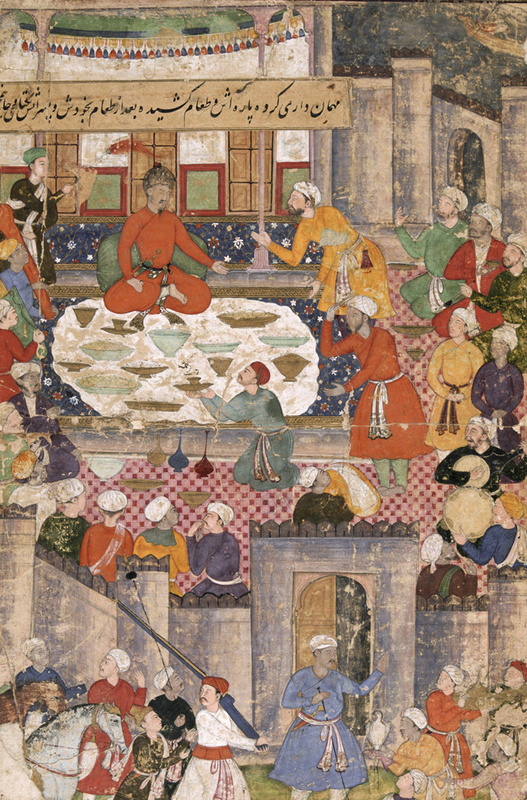 “After New Delhi and London, we have the largest collection of Baburnama illustrations in the world,” Mkrtychev adds. Renowned 19th century Russian art collector Sergei Shchukin bought the illustrations from a Persian merchant in a bazaar in Nizhny-Novgorod. In 1976, Katherine Campbell-Stibbe, then president of the board of the Nicholas Roerich Museum in New York City donated a large collection of paintings of Nicholas and Svetoslav Roerich and Asian artifacts from the Roerich estate to the State Museum of Oriental Art. The museum houses 177 works of Nicholas Roerich including paintings from his Russian, Finish and American periods. Roerich’s early works, including his 1903 painting depicting the building of a ship, were used as illustrations in Russian fairy tales. There are also 16 works of Svetoslav Roerich, including a painting of his wife Devika Rani, a noted Hindi film actress. “We are looking at cooperating with the Roerich Museum in New York so that more people can see the artwork of the Roerich family,” Mkrtychev says. The State Museum of Oriental Art provides a one-stop window to the art of Asia, and those with an interest in the history of the continent can easily spend the greater part of a day browsing through the museum’s diverse collections.